Similar to the way that 2014 Topps Archives became the Major League release, 2015 Topps Allen & Ginter will be remembered by many as the Rocky product. Check out all the Rocky-themed cards available in the eclectic baseball set. 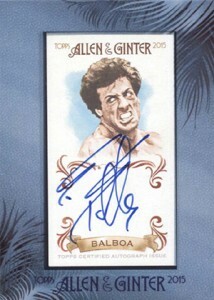 Shop for 2015 Topps Allen & Ginter Rocky cards on eBay. 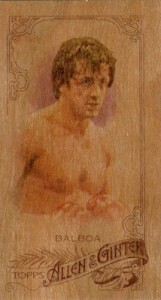 Closing in on the 40th anniversary of the underdog boxing tale, Sylvester Stallone as Rocky Balboa captivated audiences and led to multiple sequels and even a Creed spinoff. Many of the main characters are available in the 2015 Topps Allen & Ginter base and mini set and can also be found among a variety of parallels. Full-size 2015 Topps Allen & Ginter Rocky parallels include 10th Anniversary (#/10) and Glossy (1/1), while mini versions include A&G Back, A&G Black-Bordered, A&G No Number (PR=50), Red (#/40), A&G Flag Back (#/25), Wood (1/1) and Framed Printing Plates (1/1). 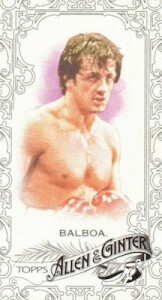 In addition to the base cards, autographs are available for a select few characters, including Stallone, and are some of the key cards in the entire A&G autograph checklist. The signed cards are basically the mini versions of the base cards that are also framed in typical Allen & Ginter fashion. 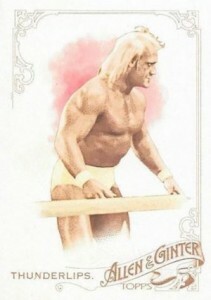 Bringing the Rocky connection into play even more, each card lists the fictional character from the movie as opposed to the actors that portrayed them. 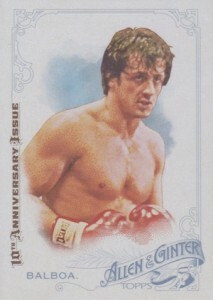 Collectors interested in more options are in luck as two of the Rocky films received their own standalone card sets back at the time of their original releases. 1979 Topps Rocky II has 99 cards and 22 stickers. 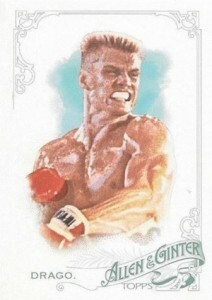 1985 Topps Rocky IV is a significantly smaller 66 cards and 11 stickers. 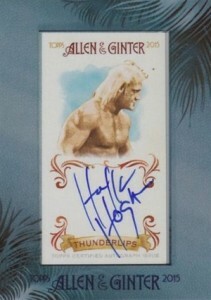 The guide below documents each of the Rocky card options in 2015 Topps Allen & Ginter. 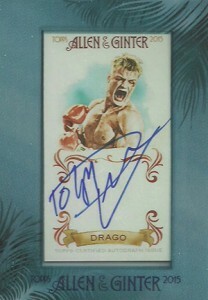 RARE 2015 ALLEN & GINTER 10TH ANNIVERSARY IVAN DRAGO CARD #229 ROCKY ERROR? 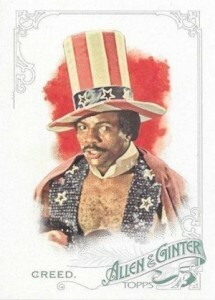 RARE 2015 ALLEN & GINTER APOLLO CREED 10TH ANNIVERSARY CARD #56 ROCKY ERROR? 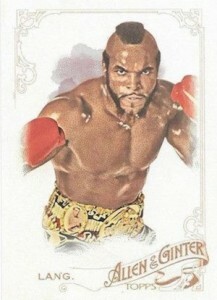 RARE 2015 ALLEN & GINTER CLUBBER LANG 10TH ANNIVERSARY CARD #102 ROCKY ERROR?